One of the world’s fastest birds, American peregrine falcons live primarily along mountain ranges, river valleys and coastlines. They are most common in parts of the Appalachian Mountains from New England to Georgia, the upper Mississippi River Valley, and the Rocky Mountains. The falcons also inhabit parts of the Pacific coast, stretching from Mexico to Alaska. A large, crow-sized bird, the peregrine falcon has a blue-grey back, barred white underparts and a black head. It prefers wide open spaces and coasts but can live in habitats ranging from tundra to desert. The falcon feeds primarily on other birds — songbirds, shorebirds, ducks, starlings and even pigeons. Peregrine falcon populations began to decline in the 1950s because of the use of the pesticide DDT and other persistent chemicals. The pesticides disrupt proper eggshell formation, leaving eggs with paper-thin shells that destroyed embryos and ultimately led to widespread nest failures. In 1970, the American peregrine falcon was listed as endangered under the Endangered Conservation Act, the precursor to the Endangered Species Act of 1973. Once on the brink of extinction, the peregrine falcon is now a thriving species. In conjunction with dedicated reintroduction programs and nesting site protection, the 1972 ban on the use of the pesticide DDT contributed significantly to the species’ recovery. The American peregrine falcon was removed from the endangered species list in 1999. Acadia National Park was selected as a reintroduction site for the peregrine falcon and began a reintroduction program in 1984 using a method known as hacking. Young captive-bred falcons are placed and reared on selected cliffs to attempt to imprint the area on the young birds. If successful, the birds return to the area as adults and establish a breeding population. A cliff on the east side of Penobscot Mountain was selected as the original hack site for the park, and the first pair of falcons successfully nested in 1991. Acadia’s nesting falcons have become a mainstay in Maine’s recovery of peregrine falcons, and more than 125 chicks have fledged since 1991. Similar hacking programs exist at several other national park units including New River Gorge National River in West Virginia and Shenandoah National Park in Virginia. National parks across the country continue to provide protections for fragile peregrine falcon populations. 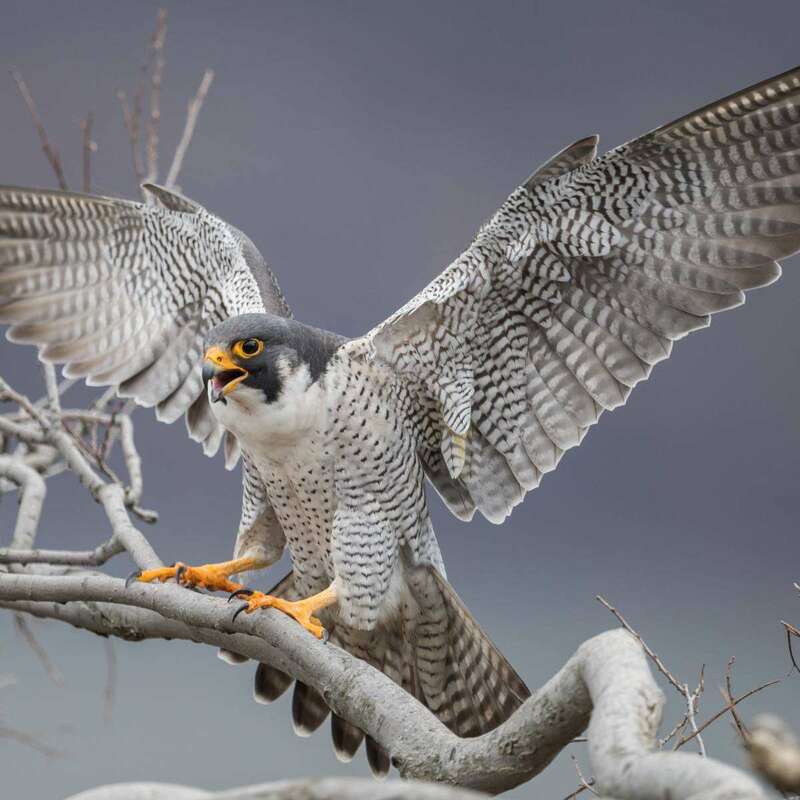 For example, staff at Delaware Water Gap National Recreation Area have monitored the falcon population in the area since 2003 to ensure the birds’ safety and optimal breeding conditions. In 2018, staff closed two locations within the park to visitors to limit disturbances to nesting pairs. This not only increases the chances of a successful nesting season, it helps ensure future visitors will be able to see more peregrine falcons in their natural environment.